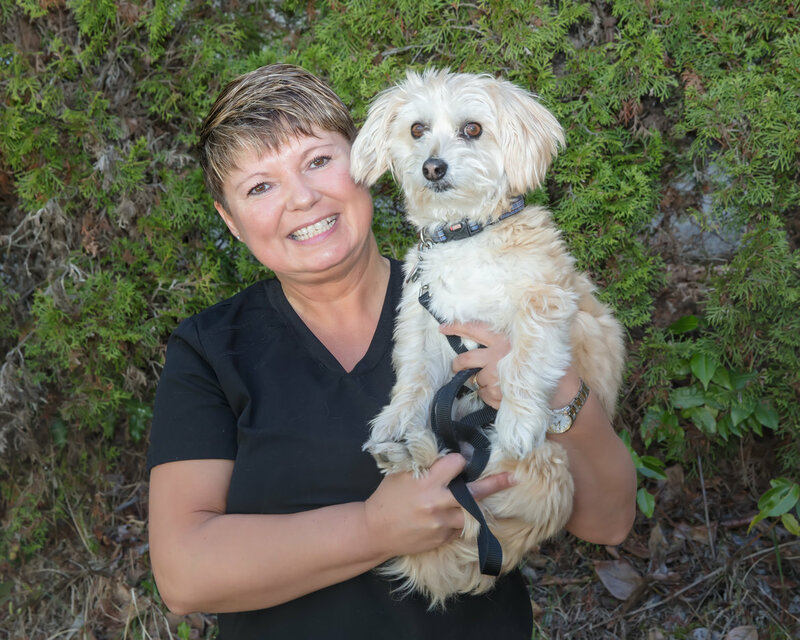 Registered Veterinary Technician Lori received her Diploma from Thompson Rivers' University in 1993. She then worked at Victoria’s 24-hour emergency veterinary hospital, Central Victoria Veterinary Hospital, for eight years before returning to Nanaimo. She joined the Nanaimo Veterinary Hospital team in 2002, and has been the lead Technician ever since. With high values on healthy living and friends, Lori can frequently be found hiking and going to the gym. In her down-time and on rainy days, Lori enjoys reading. She's even a book club member! Lori has an idiosyncratic poly-dactyl cat named Turbo. After Turbo was brought into the clinic for orthopedic surgery Lori adopted him from the BCSPCA. Turbo is quite the adventure cat, always getting up to some kind of mischief, and he absolutely loves going glamping with his mum and dad in the family trailer! Aliesha graduated in 2004 from Fairview College in Fairview Alberta. Prior to schooling she volunteered at Garibaldi Veterinary Hospital in Squamish and returned to work there after college. She has a special fondness for dentistry. Aliesha joined our team when her family decided to make Nanaimo their new home in the summer of 2018. Aliesha and her husband have an adorable baby girl named Marwyn, whose favorite activity is to pawn her food off on her fur-brothers. Wedge Antilles is a hyper two year old Labrador Retriever and Kolbassa is a loving sausage of an orange kitty who loves cuddling his baby sister. Though you may have already guessed, there is a love of Star Wars in their household! In Aliesha's spare time she enjoys doing arts and crafts and reading, mainly satirical fiction like Jasper Fforde. 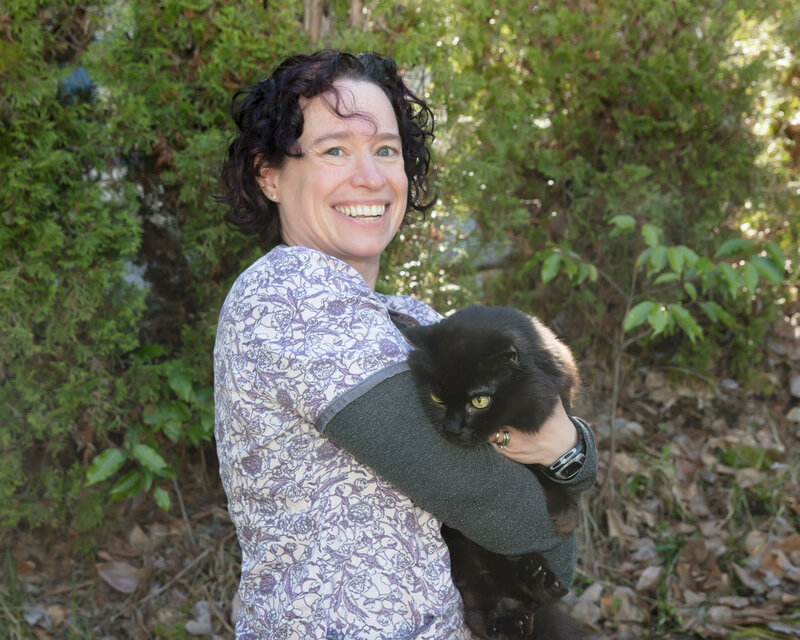 Lisa began her veterinary support career in 1998 at Guildford Animal Hospital in Surrey. She worked at GAH for thirteen years before moving to Vancouver Island with her family. 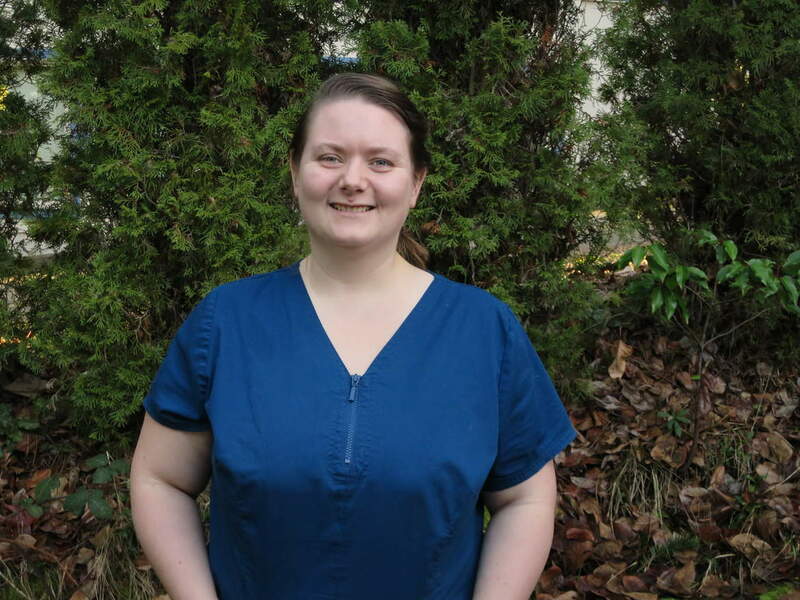 In 2013 she brought her experience and knowledge to the Nanaimo Veterinary Hospital team. Lisa is married and has a fabulous 10-year-old son. In support of her son’s current RC racing and mountain bike riding interests she can often be found at the race track or on the mountain. Lisa enjoys reading both fiction and non-fiction, with a large focus on crime and mystery novels. As a hobby photographer Lisa enjoys shooting macro nature and landscape photos as well as pictures of her family. Lisa has two Guinea Pigs, ‘Jeffery’ and ‘Hershey’ as well as a lovely Cockatiel named ‘Chevy’. Colleen graduated from the Animal Care Aide program at Vancouver Island University in 1996. In the mid-2000’s, she left her career in sales behind to follow her passion of working more closely with animals. 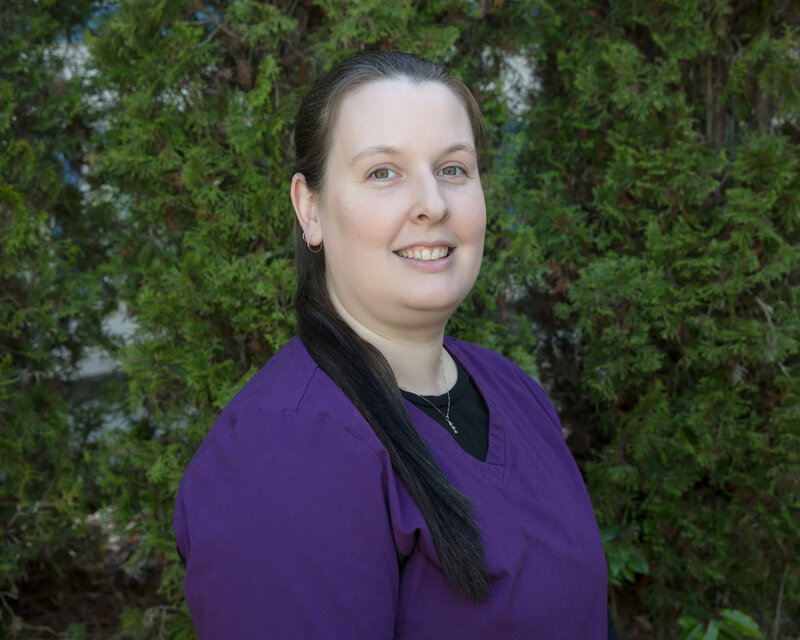 In 2010, when Colleen joined us, she brought over five years of veterinary support experience as well as countless years of customer care expertise to the Nanaimo Veterinary Hospital team. Colleen enjoys travelling and lives for sunshine. On her days off, she can often be found at the golf course or in her yard gardening. A shared love of sun, wine and golf has made California an ideal and regular holiday location for Colleen and her husband, especially during winter. Colleen has two sweetheart terrier crosses: Louie (featured in the photo above) and Pippa. Both Louie and Pippa love when their mum is home and enjoy their sunny holiday time as well! 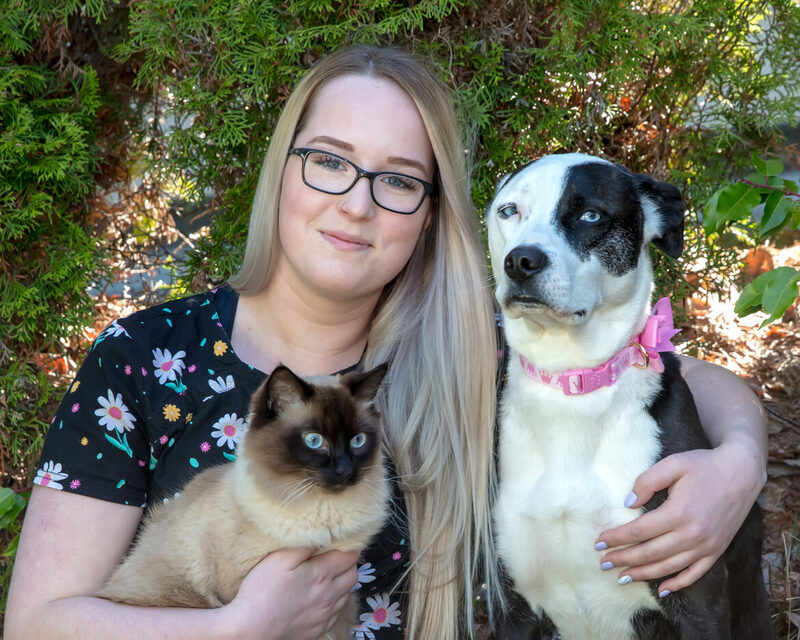 With a history of pet-sitting, volunteering with the SPCA, and co-running a non-profit dog rescue organization, finding a job in the veterinary industry was inevitable for Lane. Currently she is also taking a few online science courses in preparation for further schooling. When she joined our team in 2016, Lane graced us with her exuberant and compassionate personality and her astounding memory. Lane prioritizes time spent with family and friends and highly values those in her life. In her free time, she also enjoys hiking, gardening and finding delicious vegan-friendly food! Lane has a regal dog named Georgia and a cat, whose personality is well matched by his name, Fonzie. Georgia and Fonzie are the best-est of friends. If they aren’t playing together they can likely be found napping together! In Georgia’s free time she also enjoys doing agility with Lane. Kyla was born and raised on Vancouver Island, graduating with her Associates Degree in English from Camosun College in 2014, and her Bachelor of Arts in Professional Communication from Royal Roads University in 2015. She has a very large cat named Boo Radley who prefers sitting in sun patches ad eating his treats than socializing. Kyla enjoys playing baseball, watching curling, and reading any book she can get her hands on. 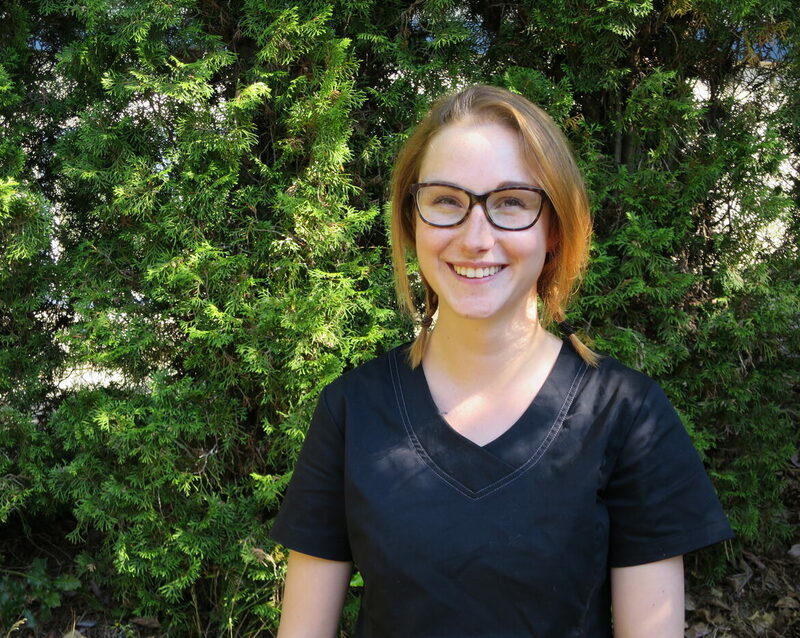 After working in physiotherapy and chiropractic clinics in Victoria, Kyla is excited to work with furry four legged patients and all the adventures that entails.